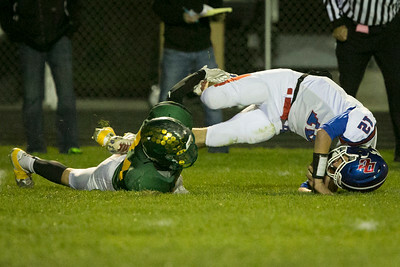 Daryl Quitalig - For Shaw Media Dundee-Crown wide receiver Sean Jay (1) dives after being tripped up on a run during the game at Crystal Lake South High School on Friday, Oct. 2, 2015. 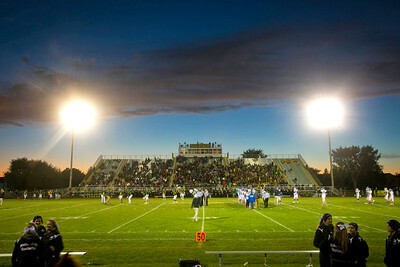 Daryl Quitalig - For Shaw Media The sun sets behind the Crystal Lake South High School west bleachers before the game on Friday, Oct. 2, 2015. Officials and attorneys representing Community High School District 155, the city of Crystal Lake and the property owners who originally filed the lawsuit against the Crystal Lake-based district for violating the city’s zoning ordinances were scheduled to meet Friday, Oct. 2, 2015 at Crystal Lake City Hall, just hours after meeting again in court. 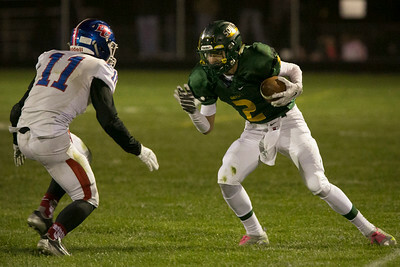 Daryl Quitalig - For Shaw Media Crystal Lake South wide receiver Matt Meyers (2) looks to run the ball after a reception during the game at Crystal Lake South High School on Friday, Oct. 2, 2015. 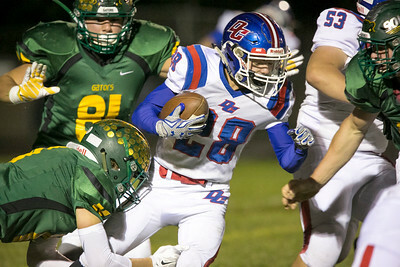 Daryl Quitalig - For Shaw Media Crystal Lake South running back Kyle Leva (33) slips past a tackle attempt by Dundee-Crown linebacker Joseph Flores (5) after a reception during the game at Crystal Lake South High School on Friday, Oct. 2, 2015. Daryl Quitalig - For Shaw Media Crystal Lake South linebacker Drew Murtaugh (11) tackles Dundee-Crown running back Gregory Williams (28) during the game at Crystal Lake South High School on Friday, Oct. 2, 2015. 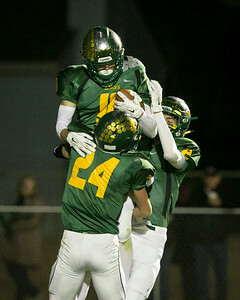 Daryl Quitalig - For Shaw Media Crystal Lake South wide receiver Drew Murtaugh (11) is hoisted up by Mike Swiatly (24) after scoring a touchdown during the game at Crystal Lake South High School on Friday, Oct. 2, 2015. 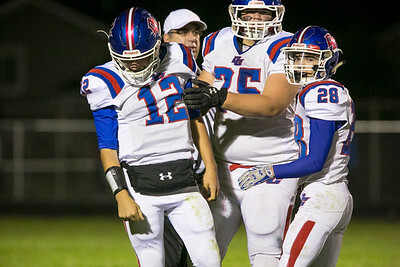 Daryl Quitalig - For Shaw Media Dundee-Crown quarterback Conor Ryan (12) is assisted up by Chandler Cowan (75) after being shaken up on a hit during the game at Crystal Lake South High School on Friday, Oct. 2, 2015. 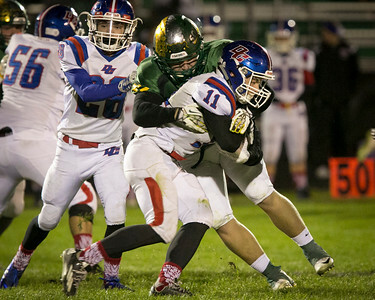 Daryl Quitalig - For Shaw Media Crystal Lake South line backer Dylan Sambrano (35) tackles Dundee-Crown quarterback Patrick Sprouse (11) during the game at Crystal Lake South High School on Friday, Oct. 2, 2015. 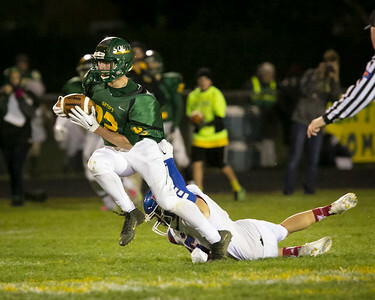 Daryl Quitalig - For Shaw Media Crystal Lake South defensive back Mike Swiatly (24) trips up Dundee-Crown quarterback Conor Ryan (12) during the game at Crystal Lake South High School on Friday, Oct. 2, 2015. 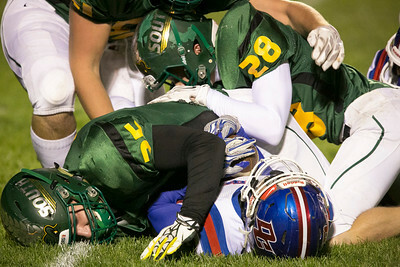 Daryl Quitalig - For Shaw Media Crystal Lake South linebacker Dylan Sambrano (35) tackles Dundee-Crown running back Gregory Williams (28) during the game at Crystal Lake South High School on Friday, Oct. 2, 2015. 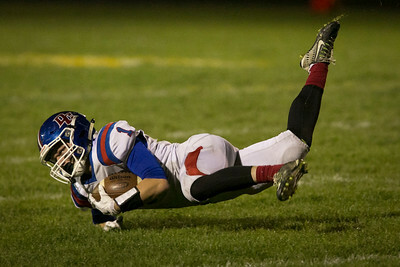 Dundee-Crown wide receiver Sean Jay (1) dives after being tripped up on a run during the game at Crystal Lake South High School on Friday, Oct. 2, 2015.